NEW RESTAURANTS, REOPENINGS, RELOCATIONS, NEW MENUS, etc. 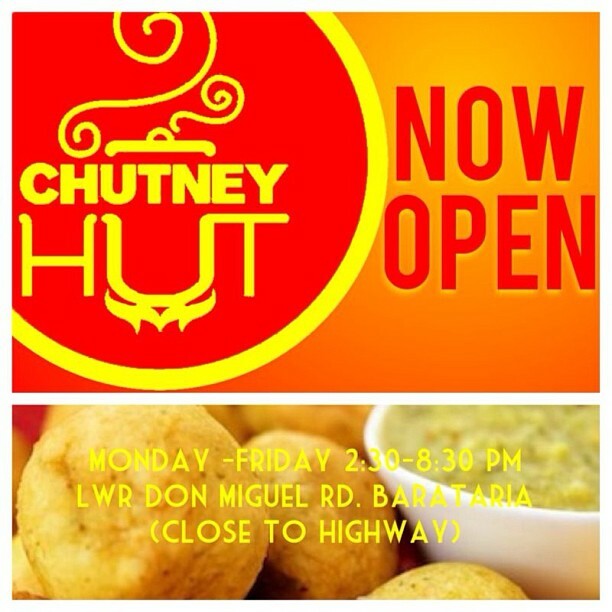 CHUTNEY HUT (Barataria, Trinidad) – Love the name and the cute branding, can’t wait to sample the food! The menu is short and sweet – Pholourie, Kachourie, Aloo Pies, Saheena and a very intriguing sounding Debe-On-A-Stick along with a choice of five chutneys (tamarind, coconut, pepper, sweet and pommecythere). Chutney Hut is on lower Miguel Road (close to the highway). Monday – Friday 2:30pm-8:30pm. THE 106 RESTAURANT @ The Chaconia Hotel (Maraval, Trinidad) – Launched a new menu, read all about it here. FRESH BISTRO (El Dorado, Trinidad) opened in September at #272 Eastern Main Road serving quick bites, sandwiches, burgers, wraps, tacos & quesadillas, grilled items and more. Monday – Saturday 10am-8pm. (868) 222-7217. Link to Fresh Bistro’s menu. PECHE PATISSERIE (Newtown, Port of Spain, Trinidad) has introduced a new tea service and has expanded its hours: Tuesday – Friday: 7am-7pm; Saturdays & Sundays: 8am-5pm, reservations are strongly encouraged on weekends. Link to Peche Patisserie’s tea menu. TOUCH N’ TASTE RESTAURANT & LOUNGE (Point Lisas, Trinidad) announced the addition of a new sushi menu starting on Monday, November 4th. EMILIANA OSTERIA ITALIANA (Port of Spain, Trinidad) introduced and “all you can eat pasta” lunch special on Wednesdays (11am-2pm). Create your own pasta bowl with spaghetti, linguine, penne or orecchiette; choose a sauce Garlic Alfredo, Pesto or Tomato Sauce; and add vegetables — mushrooms, bell peppers, onions or tomatoes. Chicken or shrimp can be added at additional cost. SAKURA ARTS, the moveable sushi & Japanese fusion artists rolled out a Friday $100 lunch special (delivery!) last week — Miso soup or Seaweed salad; California Roll, Flaming Tuna Roll or Tiger Roll; and Cucumber Makimono, Spicy Tuna Makimono or Crab Salad Makimono. Call (868) 743-6606 or message Sakura Arts on Facebook to place orders. TTHTI’s HILLTOP RESTAURANT (Chaguaramas, Trinidad) reopens for lunch to the public on September 23rd and Sunday brunch (menu link) starts on September 29th, 11am to 2pm (cost is $215). Call (868) 634-2144/4250 ext 0/288 to reserve. Lunch menu and more details on the restaurant are HERE. ZABOUCA BREADS (Woodbrook, Trinidad) reopened on Thursday, September 5th after a three week vacation. ESCA @ BRAVO (Port of Spain, Trinidad) reopened after a brief hiatus. JOSHUA’S ON THE CORNER (Port of Spain, Trinidad) – One of our favourite bloggers, Introvertly Bubbly spotted this soon-to-open new restaurant on the corner of Tragarete and Maraval Road. ZAZOU BISTRO MODERNE (Maraval, Trinidad) – Relocating to Long Circular Road (Corner of Prospect Avenue ). Opening date in October, to be advised. MR. HOPS PIZZA & GRILL (Santa Cruz, Trinidad) is coming soon to Santa Cruz. PITA PIT (Maraval, Trinidad) is opening its second outlet in the Shoppes at Maraval in October. High Tea will start at the HOTEL NORMANDIE’s CIAO RESTAURANT on Thursdays starting November 14th. Mark your calendars for the inaugural 2013 TRINIDAD & TOBAGO RESTAURANT WEEK, which starts on November 8th and runs until November 17th. Details on participating restaurants and pricing can be found HERE (link). New programme gives diners peace of mind (Trinidad Express, Sept. 16, 2013) – DineSafe program launches in San Fernando. “The DineSafe programme, an initiative of the Office of the Mayor and the public health department, will mandate all restaurants and groceries to prominently display the inspection certificate issued by the public health department. Previous post ← Sundays are for Lunch @ CHAUD! There was a great editorial in the Sunday Express I think it was, on the proactive steps being taken by the city of San Fernando to ensure that food establishments are complying with public health standards. I must give kudos to my Mayor for the hard work and commitment to this effort and hope the rest of the country follows suit. Thanks for the updates, TC.